The holidays are supposed to be a magical time of wonder, delicious food and relaxing time with the family. However, all those loving and tender feelings can go flying out the window at the mere thought of having to hang the holiday lights on the cold, frosty roof of your two story house. While holiday lighting might seem like a daunting and dangerous task that you never look forward to, here are some helpful tips when decorating your house for the holiday season. Every year, tragedy strikes when hundreds of homes catch fire from faulty wiring on holiday lights. You can avoid being another statistic and casting a dark shadow over a special time of the year by using high quality lights that are respected for safety. They may cost more initially, but it’s better to be safe than sorry. It may be a trope to have a disgruntled dad fall off the roof or ladder while putting up holiday lighting, but a fall from even a one-story house could be fatal or extremely damaging. To prevent falling, wear shoes with rubber soles to minimize your likelihood of falling. Also, when climbing the ladder, follow the directions. Some ladders recommend not standing on the highest wrung. If you have such a ladder, don’t risk it. 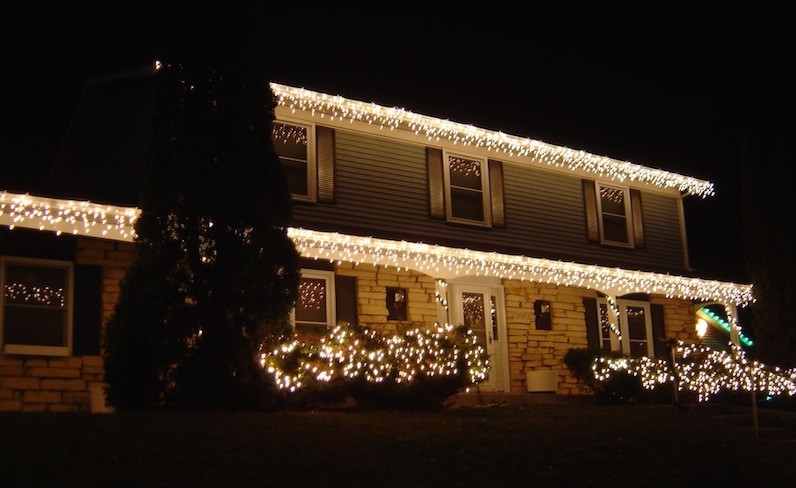 Even though you might see and want a holiday lighting display that exceeds those that appear in the movies, envisioning and executing a simple design will help keep your house looking presentable and warm. Holiday lighting experts will be able to create complex designs, but if you’re installing the lighting yourself, consider a simple design to accentuate your house. There is a much higher risk of making your house look tacky when trying to be too ambitious, especially if you have a large house. This seems pretty obvious, but many people do not have a plan of what they want to do before they’re sitting on the roof trying to figure out where to put things. Before starting the process, create a simple design and layout while looking at your home from a distance. If possible, try drawing a rough sketch of your house to figure out what lighting works best. Again, if you use a simpler design, this and the entire process will go much smoother. Even though it feels good telling people you just put up the holiday lights, doing it yourself is not always the most pleasant thing. That’s why you should look to hire a professional company to install your holiday lighting. Not only will the designs be more extensive and complex, but you’ll also ensure your house is completely safe and optimized for energy purposes. If you’re considering hiring a paid holiday lighting service, Grandview Landscape & Masonry is one of the most festive companies in New Jersey. Take a look at our holiday lighting page or contact us today.